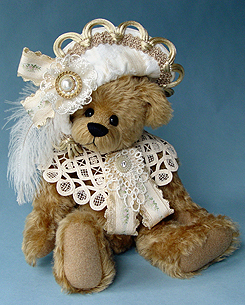 Although, award winning teddy bear artist, Vicky Lougher of Elegant Creations, lives in a very small town located in central Michigan, she traveled early in her life when she enlisted in the United States Navy at the age of 17. She spent 6 years living in Hawaii and then 22 years living in southeastern Virginia. 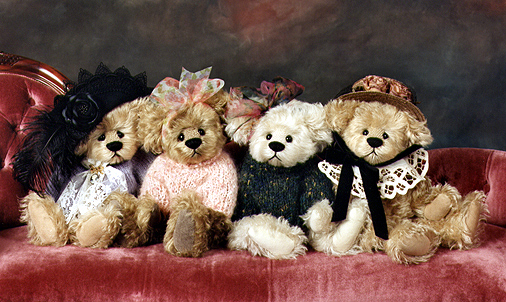 "I spent the first 12 years as a teddy bear artist, designing and creating bears in my Chesapeake, Virginia home. I moved back to the central Michigan area in the summer of 2003 after my late husband,	Gary, lost his long battle with cancer." Upon moving into her home in Ithaca, Michigan, Vicky had a large 20'X24' custom made studio built which was specifically designed for	her bear creating. "It is a lovely 2nd story room with sky lights, a gas	fireplace and a second story deck overlooking the neighborhood." And though it is jam packed with all kinds of goodies that she has collected and used in the creation of her bears, it is where she spends the majority of her time. Vicky learned to sew when she was about 6 or 7 years old. At that tender age, she also learned how to knit and was knitting her own Barbie doll clothes and sewing pot holders for the cardboard cooking stove her mother and she had created. 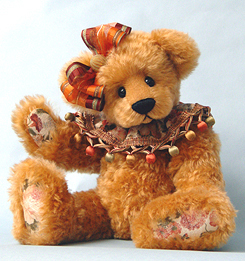 Oddly enough, Vicky says she never had a teddy bear as a child. But creativity was stirring within her. "By the time I got into high school, I was very adept at using the sewing machine and doing needle arts. During high school, my home economics teacher decided to use me as a teacher's aide working for the grade that I would receive, since I already excelled in the sewing portion of the home economics class." summer of 1991, after my neighbors saw the wedding dress I had created for myself. 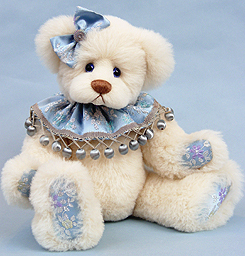 The dress making business wasn't for me, so I started dabbling a little with creating Father Christmas dolls and other	Christmas and soft sculpture items." 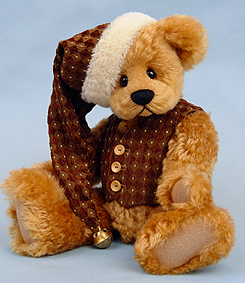 During that Fall, she also created a teddy bear from a McCall's pattern. 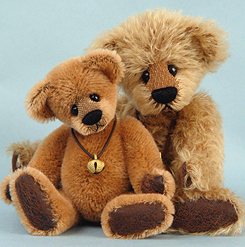 addiction and I soon discovered there were actually shows dedicated	exclusively to the exhibition and sale of the teddy bear." Vicky avidly sought out and researched as many books as possible concerning the teddy bears and devoured them eagerly. 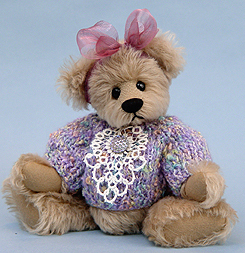 It wasn't long before she was designing her own teddy bears and by the Spring of 1993, she exhibited her first teddy bears at a teddy bear and doll show in Virginia Beach, Virginia. 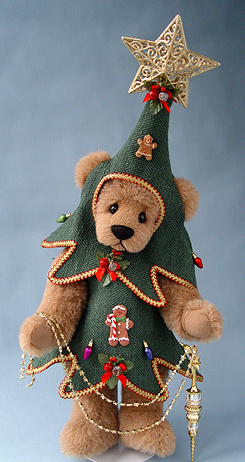 Vicky currently splits her time between working part-time as a Resident Care Technician and creating her teddies. She produces around 100 pieces a year, but has produced several hundred within a year's time in prior years. 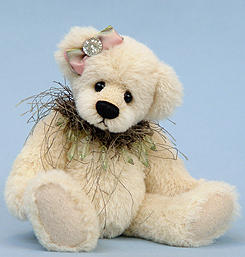 Always looking for new avenues to share her love of teddy bears with others, she is considering authoring a book which would contain some of her teddy bear designs with patterns and instructions. 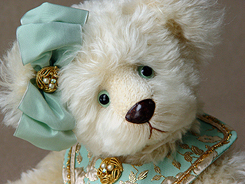 Her bears are best known for their sweet expressions and attention to detail which has earned Vicky various awards. She has been featured in numerous magazines internationally. 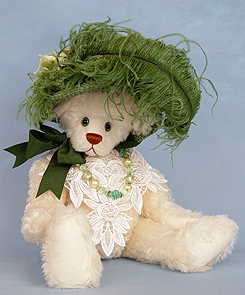 She currently sells her bears over the internet and attends several shows a year. 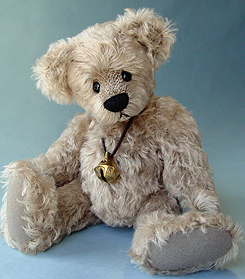 Vicky knows that even though her bears travel internationally and touch the hearts of all her collectors, home is where the heart is and her bears take a bit of that with them wherever they go.